Valentine's Day is just around the corner. It can be a stressful day to plan for some. 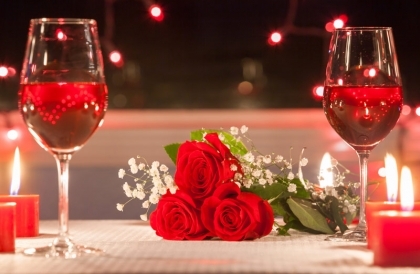 Here's how to plan the perfect date to make Valentine’s Day special. It's that time of year again - Valentine's Day is almost here! This is your chance to show the special someone in your life just how much you love and appreciate them. Well, you should do this every day, but Valentine's Day is the time to go all-out. February 14th is all about celebrating the love you nourish throughout the year. It's a moment to recognise how far you've come with your partner, and a chance to look forward together. What if you aren't sure how to make Valentine's Day special this year, though? Don't worry. Follow these steps to plan a Valentine's Day date they won't forget. Maybe this is your first Valentine's Day together and you aren't sure how forward, or serious, to be. Maybe it's your 10th and you're out of ideas on how to make Valentine's Day special again. Either way, it all comes down to the message you want to send. As much as everyone enjoys hearing the words "I love you," chances are, you say this to your partner all the time. Use Valentine's Day as a way to fully articulate your feelings. Show deep appreciation, offer support or thank them for theirs, or take the time to show your lover why it is you love them. These are all heartfelt expressions that go above and beyond regular relationship behaviours. You might even use Valentine's Day as a chance to move forward in your relationship commitments. The next step could be a key to your place, moving in together, or dropping down on one knee! Once you've thought about just how much you love your partner - and how you want to show that - it's time to get to work. Nothing says "I love you" like a cozy table for two and a candlelit dinner. Many restaurants offer special Valentine's Day menus and prices. This could be the break you needed to finally take your lover to that 5-star place in town. Or, it might be an excuse to try something new together. If you aren't sure where to go, you can't go wrong with a place which serves their favourite food. Restaurants aren't the only businesses that gear up for Valentine's Day. Check your local cinema or theare for special showings of love stories, either on film or with a live cast. See if your girl or guy's favourite yoga studio, art gallery, or brewery is offering a Valentine's Day event. This could be a fun way to share an interest you both have, or show your support for something they are into. Sometimes, you can make a Valentine's Day special just by staying at home! This isn't any old night on the couch, though. It'll take a bit of planning to pull something memorable off. Start the evening with a homemade dinner you've prepared yourself. If this makes you particularly nervous, order in or consider hiring a private chef to handle everything for you! After dinner, set up a space for the two of you to spend quality time together. You could set up stringed lights on the balcony or verandah, or lay candles out somewhere. Use this moment to pamper your lover. Go out of your way to compliment and appreciate them with your words. Do romantic gestures for them too, like giving a massage or going for a walk under the stars. Whether dinner at their favourite place or a lovey-dovey show is your plan this year, make sure you get a reservation. Valentine's Day is arguably the busiest date night of the year. The last thing you want to do is try to make it special only to end up turned away or with an hour's wait somewhere. Call and confirm with your restaurant of choice beforehand. Print event tickets instead of going digital and try to get to the venue early for good seats. Even if you're planning to stay home, plan ahead. Pick up everything you need to make this cozy Valentine's Day special before Valentine's Day actually arrives. This includes everything from the meal's ingredients (or order placement) to the romantic decorations. Cleaning your place a bit wouldn't hurt, either. After deciding what to do and making sure your number-one Valentine's Day option is available, you have to figure out what you're going to wear! This is not a jeans and t-shirt type of outing. Valentine's Day is a time to dress up and look your best for your significant other. It's a small action that both impresses them and shows you care to put in the extra effort. As such, make sure your best button-up or nice blouse is clean and ready to go. The last piece of this special day's puzzle is something that will last longer than the delicious dinner or a show's encore. You should pick up a gift for your significant other. This could be romantic like a piece of jewellery. Or get something they need, like a book they've been meaning to read, or a new piece of equipment for the hobby they enjoy. If you've just started dating, at least get a bouquet of flowers for them. Remember the importance of reservations for this, though. Most places will be running low on flowers on the day-of. Order ahead to make sure you get the best pickings. If you and yours have been together for a while, consider upgrading the traditional red roses for one Eternity Rose. This is a real rose but means much more. It's a sign of romance that never fades. This is because an Eternity Rose has been dipped in gold, silver or platinum to last as long as your love does. It has all the beauty of a real flower without the withering. Plus, many come with their own vase! Make this Valentine's Day something you and your lover will cherish for years to come. Use the steps above to make your Valentine's Day dreams happen. To seal the deal and have a sign of love for all your days together, get an Eternity Rose. Contact us today and place an order!